As the Office of Renewable Energy and Energy Efficiency notes, there are many types of green energy jobs, and many different fields to which green energy can be applied. Some of the many employment opportunities include working as a solar panel installation expert, wind turbine technician, engineer or even a farmer. [i] The qualifications for getting a clean energy job depend on the exact line of work in which you are interested. In some cases, a GED/high school diploma along with vocational school certification may be enough to land you a job. In other instances, you may need additional training in order to enter a particular career field. Technical training programs can provide excellent education in various clean energy fields including commercial and residential electrical training, solar panel installation, wind turbine installation, as well as maintenance and HVACR. Courses at such schools are significantly shorter than college and university programs and provide plenty of opportunities for hands-on work. A GED or high school diploma is typically required in order to enroll in a trade school. Graduates are given a certification that shows that they have completed the vocational coursework in fields like mechanical maintenance engineering or electro mechanical technologies. 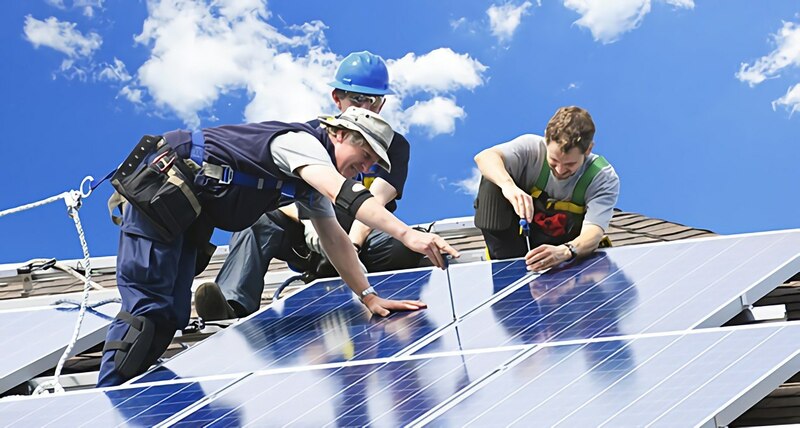 With the right training, it is possible to find work as a solar photovoltaic installer, wind turbine technician, HVACR technician or electrician. Internships do not take the place of formal study but they do have much to offer. Internships can deliver valuable on-the-job experience for your resume, can lead to better-paying job opportunities, and often open the door to job opportunities with the company where you are interning like this one recently posted on RSI. You can do an internship while enrolled at trade school or shortly thereafter, as time and financial resources allow. The Office of Renewable Energy and Energy Efficiency has its own internship programs for interested students, but it also provides a helpful list of various institutions and laboratories offering targeted internship training in specialized fields. Depending on the type of experience you seek to gain, you may even consider taking on more than one internship opportunity. Many professionals find it helpful to take courses in a particular field of specialization even after graduating from trade school and/or having worked on the job for a number of months or years. Training courses make it possible to earn additional certification that can be helpful in landing a better job and can provide up-to-date training in using new technologies and materials. Many of these courses are organized by local agencies, state agencies or organizations dedicated to advancing clean energy initiatives. Some courses are only available to certain professionals (i.e. home builders, school teachers, etc.) or people belonging to a particular minority (i.e. American Indians, Alaskan Natives), but most can be taken by any interested person who meets enrollment requirements. Those working in the HVAC field should note that additional certification opportunities are often only available to those who have a certain amount of on-the-job experience. Clean energy job opportunities are on the rise,[ii] making it possible for anyone who has the right training to find work in this field. Enrolling in vocational programs such as those offered by RSI is a good start; however, those who are considering specialized job opportunities will want to obtain further training and take advantage of internship opportunities as well.